A few good deals this week, haven't checked out all the flyers yet. 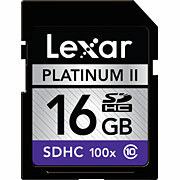 Staples has Lexar Class 10 Memory cards on sale this week. Class 10 is amazing for high quality video capture! The 8GB is on for $9.99, the 16GB is on for $14.99 and the 32GB is on for $24.99. Amazing prices, especially if you bring in the ad (printed online or paper copy) to BestBuy and price match. They will also give you 10% of the difference in price off your bill, and if you are a reward zone member, then you can collect points! I picked up a 16GB one for the hubby for his new camera---maybe that will get him working on my videos! Sobey's has their Bullseye BBQ sauce on for 3/$4.98, or $1.66 per bottle. You have to buy 3 bottles to get the sale price, but if you use 3 of the coupons, you can get 6 bottles for $4.98, or $0.83 bottle. With a price like that, you will want to BBQ every day! There are a few $1.50 off Bluewater products out there, and if you have one, head to Sobey's. This week, they have assorted varieties, including the Simply Bake, on for $4.98. After coupon, it is $3.48, and you also get a free 1kg bag of Signal (store brand) frozen veggies (assorted varieties). Not too bad! Will keep y'all posted if I see anything more. Looking to do a mass coupon trade event in the next few weeks. Will keep you posted!